Among the extensive range of all outdoor LED products from LEDMyPlace, an LED corn bulb is one of the brightest and the most energy-efficient bulbs that throws light at a beam angle of 360 degrees. 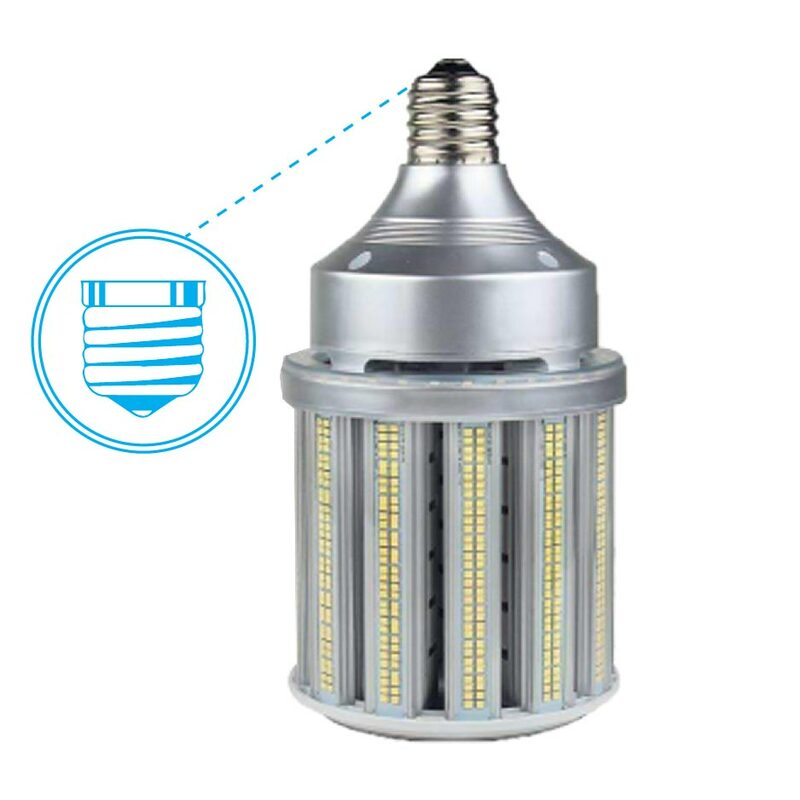 Suitable to both commercial and industrial applications, an LED corn bulb is high on waterproof rating -- a must criteria for performance as an outdoor LED luminaire. Our outdoor LED corn bulb having many LEDs arranged like corn kernels on corn cob is available in 125W to provide for high energy-efficiency and high lumen output of 13339 lumens. 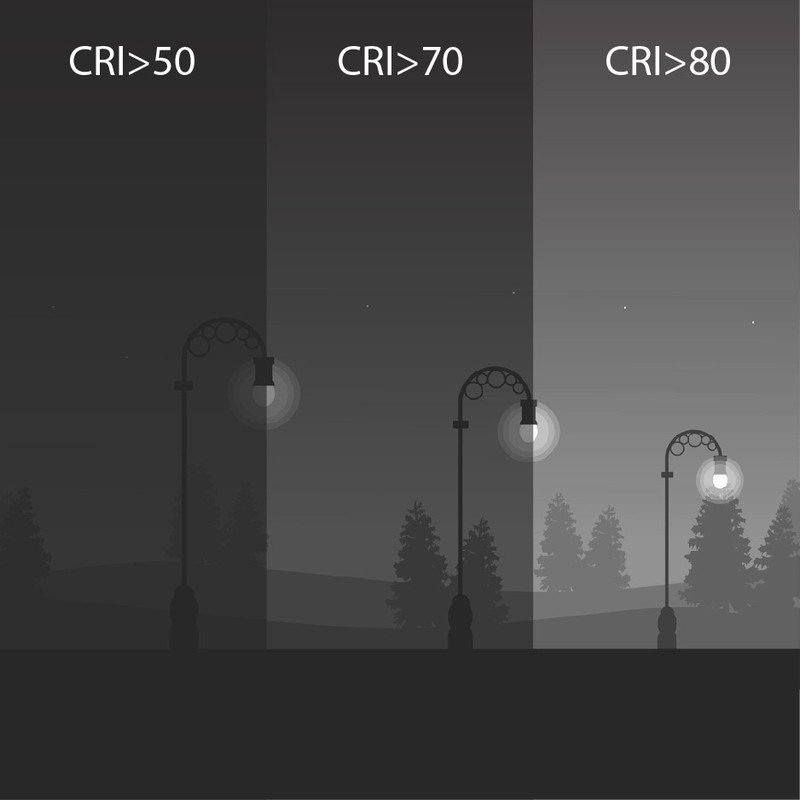 The luminare has a CRI of 80+ to provide for better viewing of objects in closer reality to natural light. With a good thermal management, an extended lifespan and easy installation option, the luminaire is completely non-toxic and free from harmful radiation. 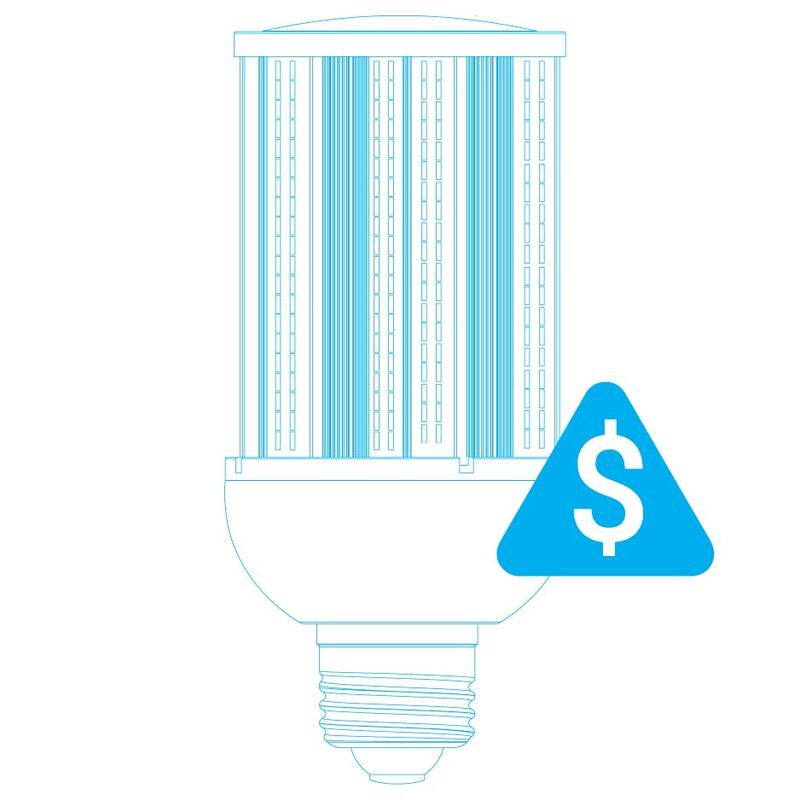 This corn bulb fixture is an ETL/Energy Star & FCC listed product. 360 degree Beam Angle: Our LED corn bulb uses the latest LED Cob chips from Epistar to project light in a 360-degree fashion. With the light beam spread over a larger area, the corn bulb attains faster cooling and longer lifespan. 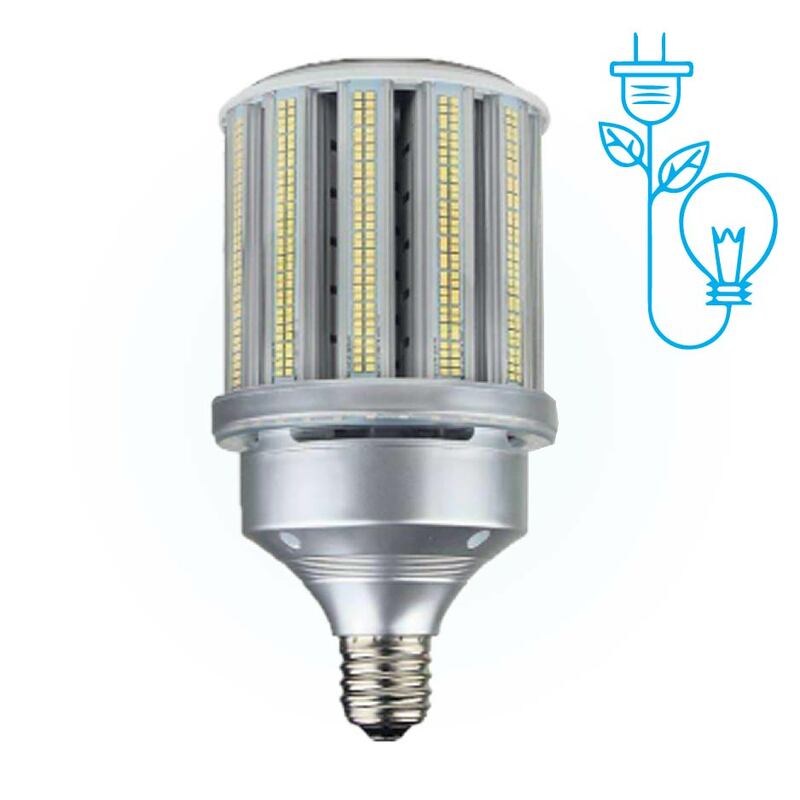 125W LED Corn Bulb To Provide For Low Energy Consumption: LED corn bulb from LEDMyPlace available in 125W is an excellent energy-saving alternative to any HID or metal-halide bulbs. A 450W metal-halide bulb can be replaced by a 125W LED corn bulb and you save 80 watts of energy. A High Lumen Output With a High CRI: Having a CRI 0f >80, this corn bulb LED can provide 13339 lumens thus allowing the commercial users to showcase their merchandise from all directions in order for the viewers to get more clarity. This product is also ideal for use in warehouse and garage. Easy To Install: A 125W LED corn bulb is not that cumbersome to install. In most cases, you will just need to bypass the ballast when retrofitting the existing fixture. E39 or Mogul Base/JustScrew-In: This 125W LED corn bulb fixture comes with an E39 base (also known as Goliath or Mogul Edison Screw) to make for a convenient retrofit to existing fixtures with E39 sockets. Excellent Heat Dissipation & Long Lifespan: A high grade, rugged aluminum is made use of in this fixture to allow for maximum heat dissipation. The fixture also lasts for at least 6 years, even if allowed to operate for 24 hours, thus there is reduced maintenance, operation and replacement cost. 5 Years Manufacturer’s Warranty: This product comes with a 5 years warranty to enable your use of the product a safe and satisfactory experience. IP64 (Weather Proof): Our LED corn bulb comes with an IP64 rating to make the luminaire withstand total dust ingress and water jets from all directions to survive any harsh weather condition where there is an exposure to dust, dirt or any moisture condition. The installation of LED corn bulb comes super easy and all you have to do is after turning OFF the power, take out the existing lighting fixture (CFL, MH light or HPS etc.) and screw in LED corn bulb. Then, turn the power ON. If it’s a fluorescent lamp, you just need to bypass the ballast. The LED corn bulb has a beam angle of 360 degree and hence it provides illumination around its full circumference. For any outdoor lighting of signages, billboards and indoor lighting of products inside a warehouse or barn, 360 degree lighting is extremely effective as the viewers can get a glimpse from all corners. 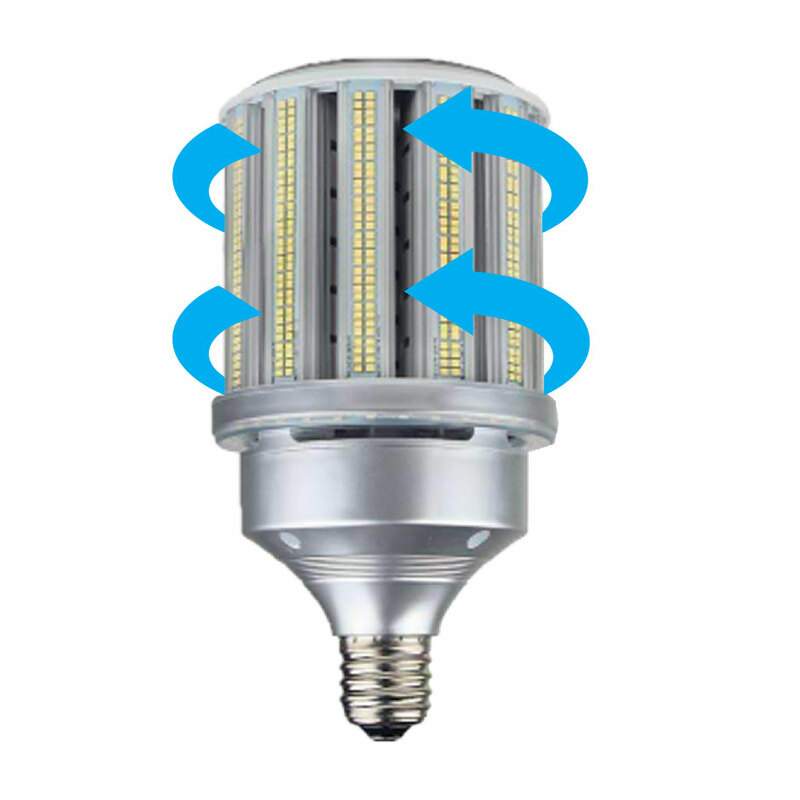 The LED corn bulb has an internal heat sink made of aluminium that perfectly fits the bulb requirement of heat dissipation. The heat sink is big and yet very light-weight to ensure good thermal conductivity. The LED corn bulb has a more than standard color rendering and that means lighting is appropriate enough for objects and spaces to look real as what they would look in natural light. 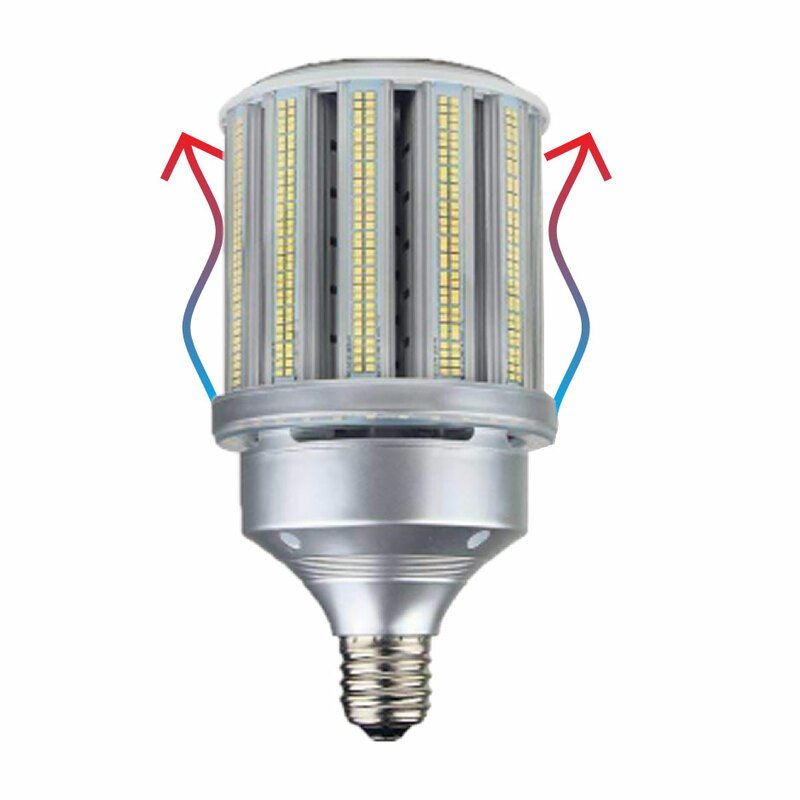 The external housing of LED corn bulb is constructed out of a rugged die-cast aluminium to withstand external tampering, rust, corrosion etc. The LED corn bulb unlike the conventional bulbs or other lighting fixtures does not get heated up too soon and so needs no cooling down to operate. Whatever little heat it generates gets dissipated by the internal heat sink made of aluminium. The beam angle of our LED corn bulb is 360 degree and that means lighting emitted around the whole area/circumference of the corn bulb. This helps viewers to see the merchandise from all angles. 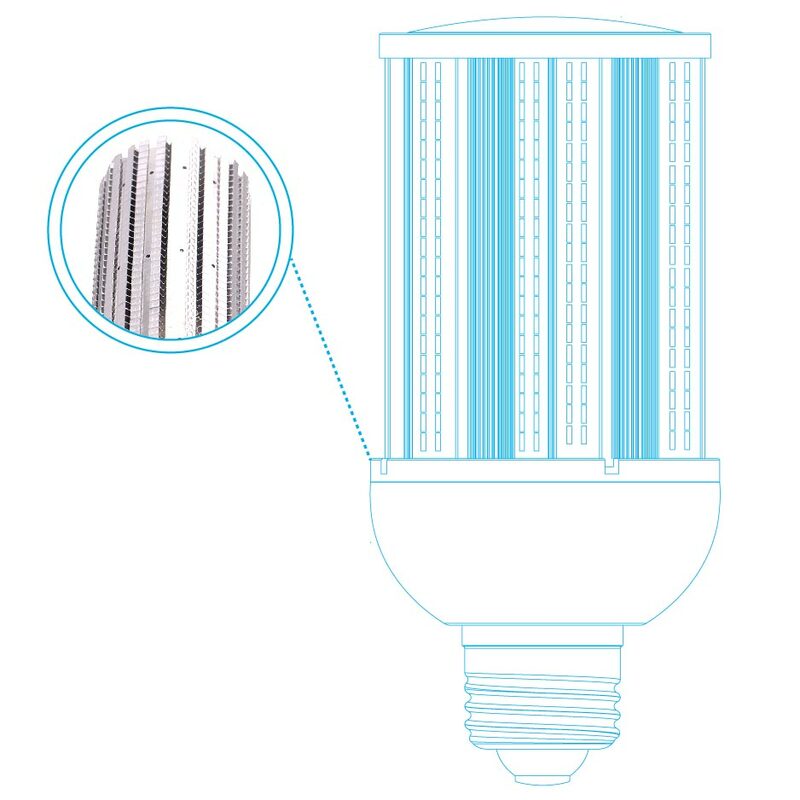 With 50,000 hours of lifespan, the LED corn bulb does not need any maintenance or needs very low maintenance until the end of its lifespan and this is in extreme contrast to metal-halide or HID lamp fixture when you need to replace the fixture more than twice during the service life of the bulb fixture. 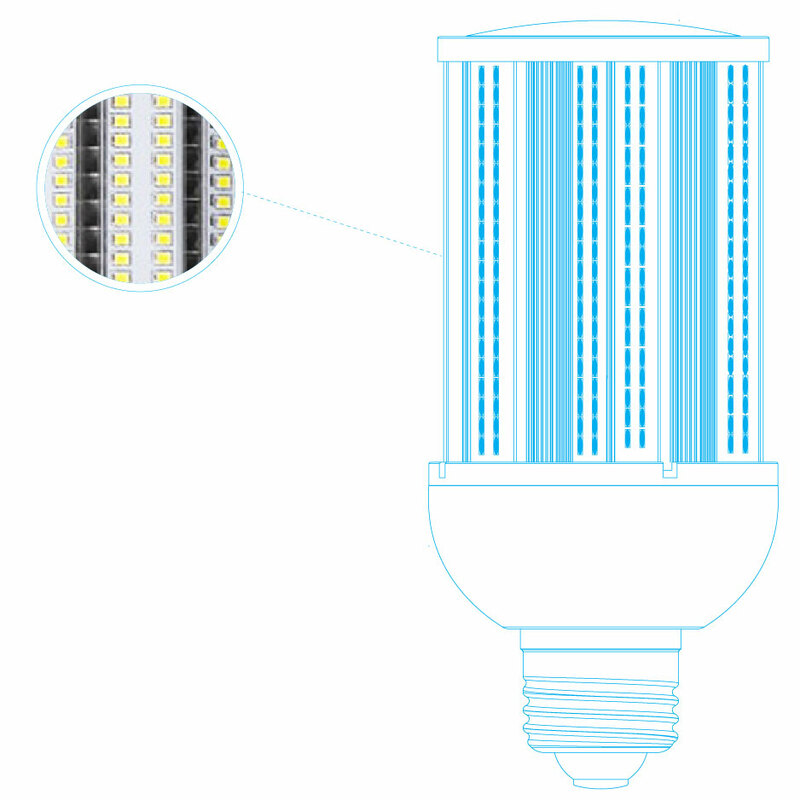 We use LED Cob chips from Epistar for maximum operation efficiency of the LED corn bulb. Also, because of such chips, the light beam is spread over a larger area with corn bulb attaining faster cooling and longer lifespan. All our corn bulbs come in either of the two base types -- E26 or E39. The E26 is known as the medium base and is the standard base for which the sockets are commonly found in many fixtures. The corn bulb with E26 base is quite easy to install, you just need to screw in. 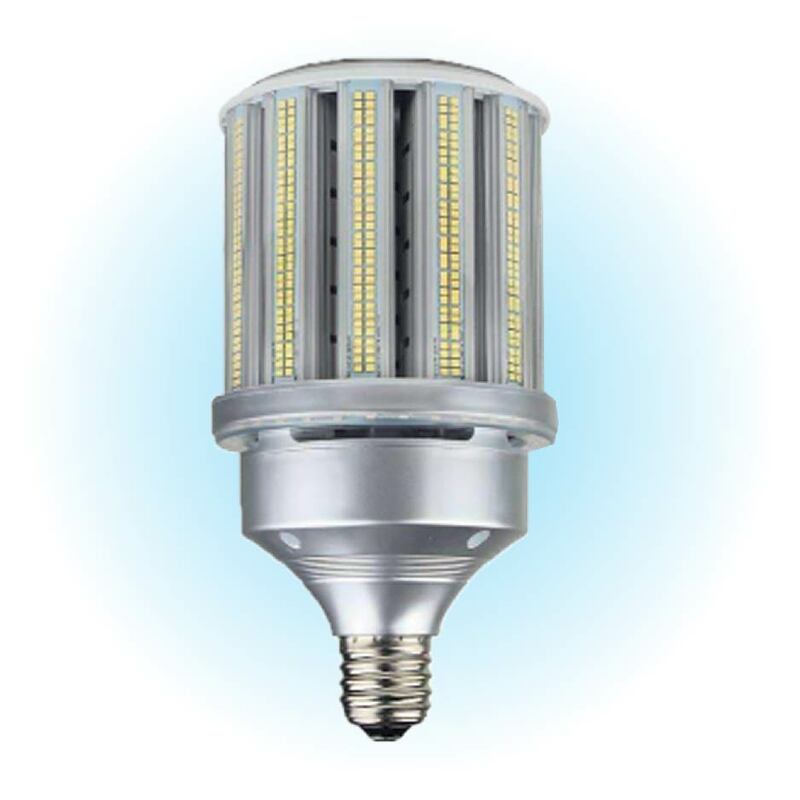 Our LED corn bulb in 125W is available with an E39 base. 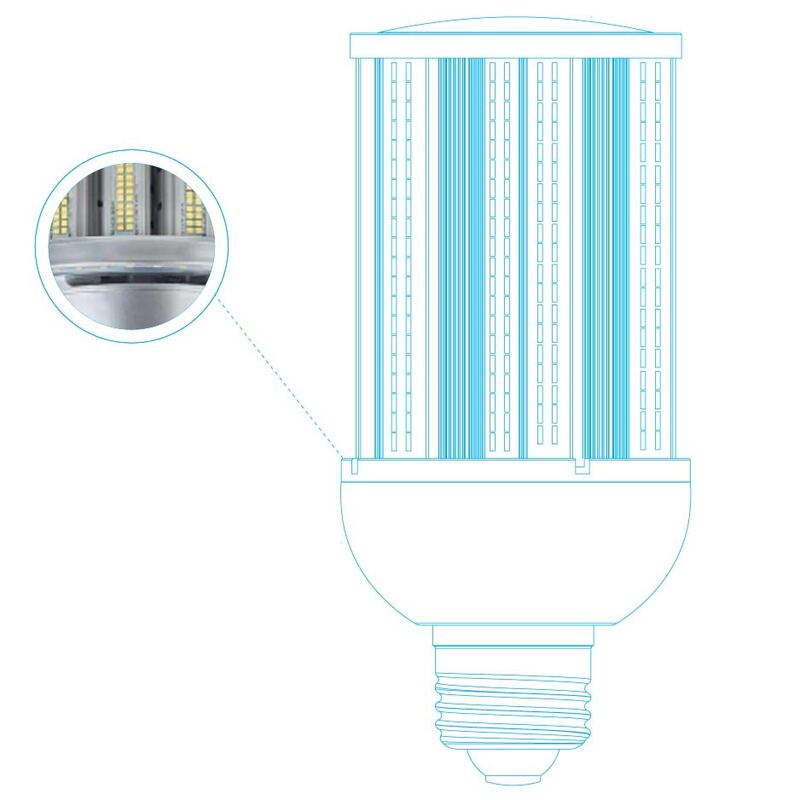 An E39 base also known as the Goliath or Mogul Edison Screw is usually found in industrial lighting fixtures so you will find our LED corn bulb a convenient retrofit for all traditional lighting fixtures that have an E39 sockets. The LED corn bulb brings about 75% of energy-savings and hence there is a reduced utility bill for you every month to 75% extent. The LED corn bulb is DLC approved and that means you can be perfectly eligible for rebates. UL (Underwriter Laboratories) certification is recognized by NRTL (Nationally Recognized Testing Laboratories) – an organization regulated by OSHA (U.S. Occupational Safety and Health Administration). Commonly seen on electrical products, a UL certificate signifies that the products are safe to use in public spaces. 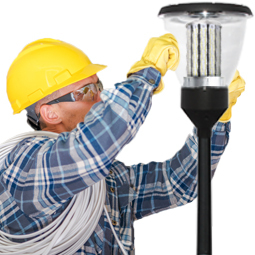 They are checked for hazardous elements and once the lights pass the test, they are certified by UL. Taking care of the environment is a responsibility that everyone should feel accountable for. The good thing is that lights and luminaries available at LEDMyPlace comply with environmental safety and can be categorized as Green Lights. These lights are completely free from toxic and hazardous chemicals like Mercury and Lead. Using them, you not only save money, but you help contribute towards reducing the environmental impact of traditional bulbs on the Earth. All our products come with a 5-year manufacturer warranty that gives you peace of mind knowing that in case of any operational fails - we have your back. If, in case you are not simply satisfied with your order parcel within 30 days of receiving it, you can talk it out with us and look forward to a refund. For any of the above problems, all you have to do is get connected with one of our Customer Care Executives and we can take it forward from there on. Bulb looks to be very well built. The light output is amazing! Will purchase more bulbs! Lots of light - works well. We have a 'reflector' over the top to help direct light down. This is the best ever for replacing high bay lighting bulbs and maintenance and the start up time that it takes for them to come on especially when somebody hits the switch by mistake and turn the light off and it takes them three as long to come back on! I recommend anybody that had to replace bulbs and maintain Balusters and transformers and fixtures to use these it is 100% change for anyone on maintenance and the monthly bills!